It thankfully happened: after all these years, Caltrain has finally stated something (anything!) about level boarding. This is an improvement that has long been neglected in favor of the more flashy electrification project. Platform height: the full collection of articles from this blog. Read it and weep. There is also a nice APTA overview presentation that goes into some detail about the conflicts between level boarding and freight trains. Caltrain's presentation sums up the main advantage of level boarding in one bullet point, "Operating efficiencies," without clearly stating why it's so important. Level boarding reduces trip times. Without steps, passengers can board and alight far more quickly and the train can save about 15 seconds of dwell time at every station stop. For an all-stops local, this starts adding up, and saves about half again as much as much time as saved by switching from diesel to electric! Level boarding reduces delays. Wheelchairs, bikes, strollers, hordes of drunk Giants fans, airport travelers with suitcases, everybody can get on and off far more quickly and easily. As any rider will tell you, station dwell times suffer from a statistical "long tail" of agonizingly long station dwells due to a variety of these factors, a sort of station dwell Russian Roulette. The only way to run this railroad is to add plenty of timetable padding to absorb these anomalies without making a mess of cascading delays. Fast forward to 2030: under a blended scenario where hourly traffic is doubled on largely the same tracks, this is no longer acceptable. Station dwell times must be predictable and reliable to avoid making a mess of the morning rush, and level boarding isn't just a nice-to-have; it is a must-have. Caltrain's tentative plan is to study the possibility of converting all station platforms to 25 inches above rail (up from today's 8 inches) by some unspecified time in the future, and to let high-speed rail have its own set of separate platforms, most likely at 48 inches above rail. 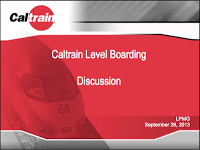 Level boarding as envisioned by Caltrain is not a trivial undertaking. It will be expensive, because dozens of platforms will have to be entirely rebuilt. It will be politically difficult, not in the least because state regulations will need to be overhauled over the strenuous objections of freight railroads. It will be time consuming, because so many platforms can't be rebuilt overnight. It will be logistically complicated, because the system will have to continue operating during the transition with a mix of platform heights. Why not go a tiny bit further to achieve far greater benefits, at far lower cost? Platform sharing is the next step beyond level boarding, where Caltrain and HSR can share the same platforms at San Francisco, Millbrae and San Jose. Platform sharing has distinct advantages that have been discussed at length on this blog. Platform sharing between conventional trains and high-speed trains is already practiced everywhere in the world, except in those countries where track gauge precludes it. San Francisco Transbay is where all the action will be. There are more jobs within a half mile of Transbay than there are within a half mile of each and every Caltrain stop, combined! Service into and out of this tiny six-track terminal station will be inherently inefficient but crucially important for both Caltrain and HSR. Platform sharing would increase Transbay capacity for decades into the future. Millbrae is where the HSR consultants once expressed interest in building a $1.9 billion dollar tunnel to shoehorn new platforms between a handful of residential properties and the existing BART station, which incidentally cost only about $0.1 billion to build. Never mind the sheer fiscal insanity of it: platform sharing would allow the station to serve both Caltrain and HSR within its existing footprint. The mid-peninsula HSR stop would be nothing more than another platform where a high-speed train happens to stop, should that be deemed advantageous. San Jose is where the HSR plans get truly loopy: they want to build a massive station up in the sky over the existing station, hovering on a forest of concrete straddle bents, with a six-mile approach viaduct to the north and an "iconic bridge" (Bay Bridge east span, anyone?) to the south. Platform sharing would enable both HSR's and Caltrain's needs to be met on a single level, at grade, within the existing footprint of the station. This would save billions of taxpayer funds that the HSR authority seems to be rather short of. Why are the respective agencies here not talking about platform sharing? There is bureaucratic inertia and a general unwillingness to coordinate, sometimes verging on outright hostility. Get HSR to back off from the airport-like notion of separate, dedicated platforms. Building a TSA security perimeter around the HSR system while leaving Caltrain open won't prevent mass carnage, any more than locking the doors on only one side of your car will prevent theft of your belongings. HSR can be built far more cheaply with platform sharing. Of course, none of these measures would be favored by the for-profit Transportation Industrial Complex. Get Caltrain to back off from the idea of 25 inch platforms. Not all bilevel EMUs must have low doors; some of the latest models work with high platforms, and there are smart ways to facilitate a height transition by adding additional doors to the EMU fleet. Or try another way: get HSR to adopt a 25 inch standard; good luck with that. And please, don't myopically plan everything around the Bombardier fleet staying until 2030. Get the Transbay JPA and San Francisco to understand the economic advantages of platform sharing: a busier, more efficient and more commercially successful terminal, and the opportunity to reclaim much of the under-utilized train parking at 4th and King for redevelopment. None of these challenges are technical. They are institutional and political.